Mingo spent the early years of his life living a short way from a big hill that he had to walk down to get into the main part of the park. Not only is the hill long, but it is very steep. It's the kind that you are very grateful that you are riding a horse when you are traveling up it. Before he was old enough to ride, I would lead him down the hill whenever I had the energy to lead him back up. From the beginning, he was slow and not the most coordinated horse. I truly believe that much of it was cause by some conformation problems that he has, but fortunately, over time, he got to the point where he would move slowly, but steadily down the hill. By the time I started to ride him, he did well enough. When he was 5, we moved to a different neighborhood. We rode on the same trails, but we didn't have to go down the big hill to get to them. We still have to go down a long hill to get into the valley, but it isn't very steep. In fact, I often walk the horses up the hill on the way home to give them and my saddle weary muscles a break. We would go back to the Big Hill, now and then, but we traversed it far less than we did in the past. A year and a half ago, Mingo got a bad injury on his back leg that prevented him from being ridden for a couple months. He finally recovered, and when we went on the Big Hill, he had a terrible time going down it-even though I led him. He was unbalanced, unsure and uncoordinated. I realized that he simply wasn't ready for it. I decided to condition him more before trying it again. Shortly afterwards, he was struck down by a horrible hoof abscess that we ended up fighting for more than a year. It seemed like I would never be able to get him physically fit when every month or two, he was off for a couple weeks. Well, this summer, we got it under control, and we started working Mingo on a regular basis. I didn't know what to do. It seemed to me that this was a 2-pronged problem. First, he was having a physical problem coordinating his legs. He wasn't using his hindquarters correctly. The second prong was a confidence issue. I think that he was worried he would either hurt himself or slip as he went down the hill. He would often stop and refuse to go on. There was a possible 3 prong, but I couldn't be sure if it was true. Could he have been reluctant to leave the area of his old home? He was so enthusiastic as we got closer to it and so visibly upset when we passed it up. He has a balky nature to begin with. Could some of this be balkiness? I became determined to help Mingo fix his problem. I thought about what to do for a long time and then implemented my plan. The reluctance to leave his old home was the easiest to solve. It simply meant spending enough time up there so that he understood we didn't plan to visit and munch hay in his old stall. By taking him up there with other horses, he had something else to think about, and then he would go back to his new home and munch his hay there. Mingo going up a small slope. Now, I still had the problem with his coordination and confidence. Since I didn't want to practice this hill over and over, and since it was already too dark in the evening to ride on the trail, I decided to do as much as I could in the arena. I now focused his work on anything that would get him to work better with his hindquarters. We did plenty of backing, transitions and collected work. We had done this in the past, but I increased it considerably. I noticed that his pokey trot was gradually changing into a longer-strided trot. In the beginning, it took quite a while before I would notice the change, but after about a month, he would adjust his trot after a short warm up. For the first time, I concentrated heavily on walk/canter transitions. He seemed to like them a lot and became fairly consistent with practice. I was feeling more hopeful. I also did a few things on our shorter trail rides. There were some days when I worked the hill right by our current barn. There are a few places where the slopes weren't very steep, so I decided to try something radical for the horse who has trouble walking down hills. We trotted down them. At first, he said it couldn't be done, but with some coaxing, he seemed to understand that it was possible if he was slow and careful. We also trotted and cantered up the hill. Poor guy would be out for almost an hour going up and down. I started to see some improvement. 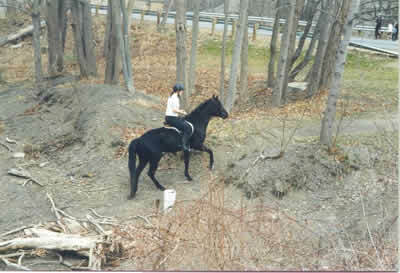 We would have done some cavaletti in the arena if we had them available to us, but since we didn't, we went to a narrow winding unmarked trail at the bottom of the hill that had a lot of small logs in the way. We walked and trotted that trail many times, back and forth. To get to that trail, we had to go into a very steep ditch and climb out on the other side. I think this helped him with his confidence. A side benefit-the zigzagging around the trees made him much more responsive to my legs in a very short time. We hadn't gone on the Big Hill for a while, but I figured it would be time to try it soon. My sister took Mingo out by himself one day when I was out of town and worked the hill by the barn. She told me that Mingo did far better for her than he did the last time she rode down the hill. This really made me hopeful. I would have to try the Big Hill. One day, I was riding him by myself, and had enough time to try it. I needed the extra time because it could take 10 minutes to get down that hill. We headed that way. He was excited about going up there. We trotted all around and had a lovely time. When we passed up his old home, he didn't seem that upset, and willingly left the area. We headed to the hill. This was our big moment. Did anything I do help him at all? I'm glad to say that he walked slowly, but he walked steady. I believe it was just as fast as when he used to live up there. A few times, he got a little crooked and drifted to the edge. If he would have stepped off the edge, we would have fallen many feet. Fortunately, he responded when I straightened him out and moved him over. He never stopped a single time on the trip down. Needless to say, I was smiling the rest of the day, and I'm smiling now. The big question is, did he do better because of all the work I did with him, or was it only because he finally learned that he wouldn't get to visit his old barn and didn't live there anymore!